Written by Georg Holzmann on May 20, 2016 in Audio, News. Does anyone need an easy-to-use, free audio editor for the most used operating system in the world? 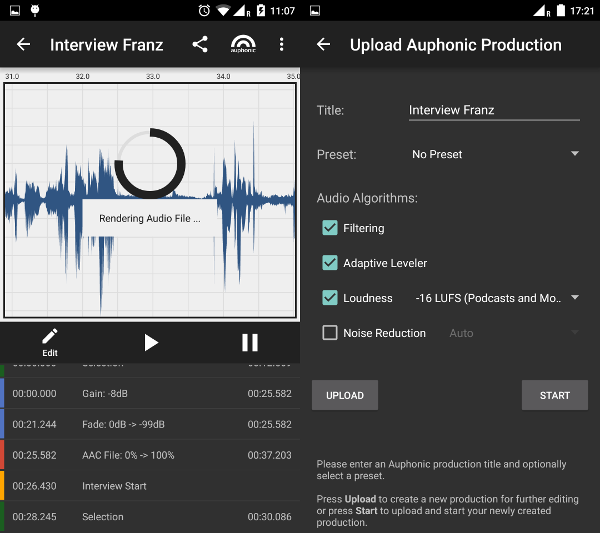 Here is Auphonic Edit , a new audio editor and recorder for Android. 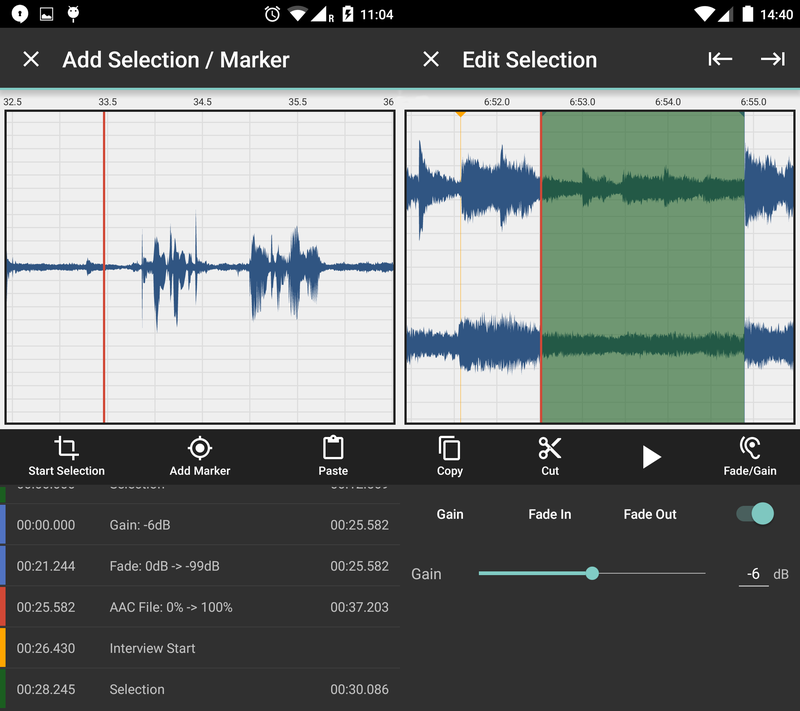 Auphonic Edit is a non-destructive audio editor and recorder with focus on ease of use, high-quality audio and stability. In combination with the integrated Auphonic web service, you can post-process, encode, tag and publish your podcasts, interviews, music recordings on the go with a single click. It is possible to use the internal microphone or any external USB audio interface/microphone for professional audio quality and all default Android pre-processing is deactivated to get the raw audio signal. 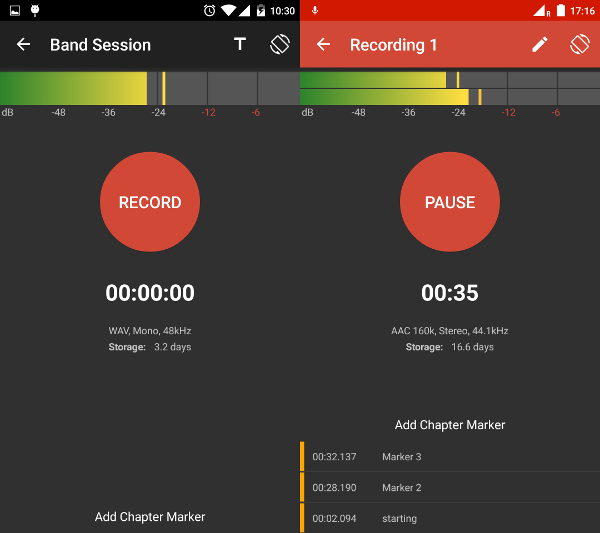 Our recording interface displays the current maximum peak level, available recording time, you can add and edit chapter markers and it also records in background while using other apps (yes, that's possible on Android). The recorded signal is encoded in an uncompressed WAV or compressed AAC format, written to disk every audio buffer so that no data loss happens if the app gets killed. Existing audio editors for iOS and Android are often very confusing and try to include as many features as possible. They borrow heavily from Desktop software idioms, and are hence visually cluttered and have many non-discoverable elements. Auphonic Edit implements the minimum amount of features required to cover the most common audio editing tasks, conforming to standard native UI idioms of Android. Full waveform display of all audio files including zooming, seeking, scrolling, etc. Adjust volume gain of selections, add fade in/out etc. 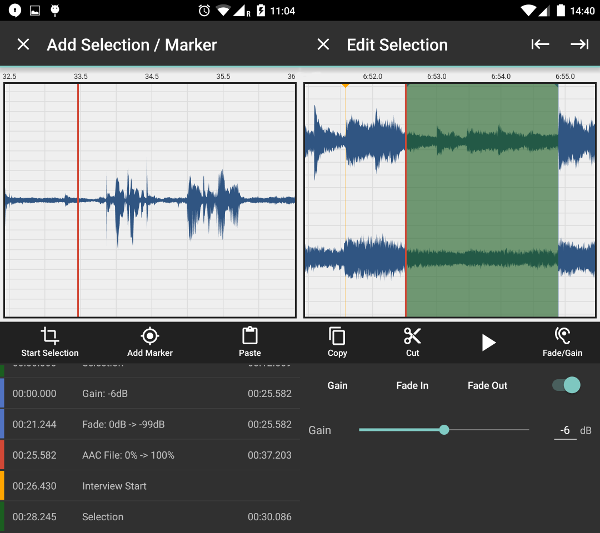 You can render your audio session into an uncompressed WAV or compressed AAC file and share the result with any other Android app on your device. Upload audio files, including metadata and chapter marks, in the background directly from Auphonic Edit to our web service. Select one of your presets to perform audio post processing (loudness, leveling, noise reduction), encoding/tagging and trigger publishing with one click directly from your phone. Try Auphonic Edit, it's free! Please send us your feedback, bug reports and feature requests to android@auphonic.com.